Situated 850 feet above 50th Street, the Top of the Rock is a multi-level observatory at 30 Rockefeller Center. First opened in 1933, the viewing platform resembles the decks of a luxury ocean liner, which was a popular stylistic design in Art Deco architecture. The observatory closed in 1986 for 20 years to undergo a $75 million renovation project and reopened in 2005. Visitors can enjoy panoramic vistas of numerous city landmarks, such as the Brooklyn Bridge, Central Park, St. Patrick’s Cathedral and the Chrysler Building. Although the viewing platform is not as high as the Empire State Building Observatory, it is widely believed to provide the best view of the city. 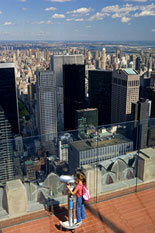 The Top of the Rock enables guests to see the Empire State Building and the rest of the Big Apple. This feat is not possible from its competitor’s 86th floor promenade. The Top of the Rock Observatory has indoor and outdoor viewing areas, which protect visitors from extreme weather conditions. The observatory’s timed entry system and staging areas reduces waiting time for the attraction. Guests can reach the 67th, 69th and 70th floor observation decks on high-speed, glass-topped elevators. As the cab ascends to the upper floors, the interior lights are dimmed and a blue light above the car is turned on. This light illuminates the elevator shaft so that riders can view the ascent and descent of the car. During the one-minute ride, music and a series of animations are displayed on the ceiling.